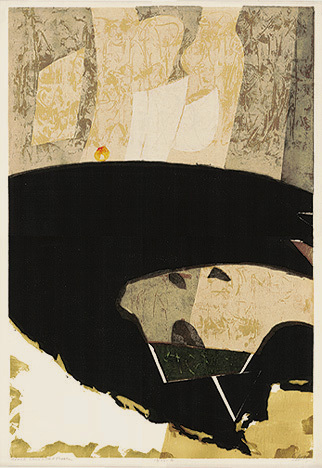 Floating Island - - c.1950, Color Woodcut. Edition 200. Signed, titled and numbered 54/200 in pencil. Image size 9 3/8 x 33 1/2 inches (238 x 851 mm); sheet size 13 1/2 x 37 3/8 inches (343 x 949 mm). A fine impression, with fresh colors, on cream Japan; full margins (1 5/8 to 23/8 inches), in excellent condition. 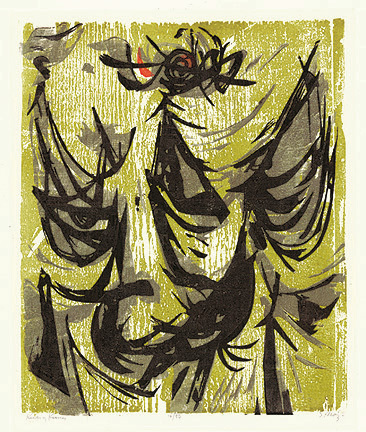 Kuang Kung - - 1952, Color Woodcut. Edition 50. Signed, titled and numbered 16/50 in pencil. Image size 14 3/8 x 12 inches (367 x 303 mm); sheet size 21 x 15 1/8 inches (533 x 384 mm). A fine, fresh impression, on off-white wove paper, with full margins (1 3/8 to 3 3/8 inches), in excellent condition. Black Stone and Red Pebble - - c.1970, Color Relief. Edition 200. Signed, titled and numbered 13/50-II in pencil. Image size 29 13/16 x 20 1/8 inches (757 x 511 mm); sheet size 31 7/8 x 21 7/16 inches (810 x 545 mm). A fine, fresh impression, on heavy cream Japan, with margins (3/8 to 3/4 inches), in excellent condition.